I finally tackled homemade fruit roll-ups! I searched several different recipes but wasn't satisfied because many of them used a ton of sugar. So I decided to stick with the basics and alter the recipe depending on how the first batch tasted. I used about 2 cups of fresh strawberries and 2 cups of a hodgepodge of berries and mango I had in the freezer. I defrosted the frozen fruit and tossed everything into a blender. After I completely pureed the mixture, I added 2 pinches of sugar and blended again. Then I poured the mixture into the dehydrator tray that is designed for fruit leather. I dehydrated it for 9 hours but it was still gooey on the bottom. (Next time I won't add quite as much fruit so it dehydrates faster.) Regardless, it was pretty tasty. It had a bite of tartness and tasted so fresh. Unfortunately, it took 9 hours to make, but we ate it in less than one. Part of me wants to sprawl out on one of these and take a nap. However, the other part of me wants to get a running start and see how high I can make it swing. Either way, I'm loving these floating beds. Thanks to A Cup of Jo for opening my eyes to sleeping in the air. I also really wanted to test out my husband's new tool he set up on my blog. It makes creating a photo layout super slick! The blog's first year has flown by! After writing my first post, I had no clue what direction I would go next. But what started as Don't Call Me Kathy (and I'm serious, don't call me Kathy), has turned into such a fun space for me. I have high hopes and am excited for another eventful year. Thanks for sticking with me! I love and hate peeps. Generally the only purpose they serve is filling me with guilt and nausea. However, this idea is genius and makes me actually want to venture down the Easter isle. As the temperature keeps climbing, my excitement for pool and beach days rises. 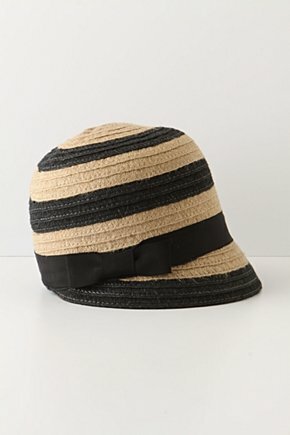 One of my summer necessities is hats...and lots of them. Mine normally get smooshed after a few months of cramming them in my tote, so I find myself always searching for backups. I've been a vegetarian for about 3 1/2 years now (well technically a pescetarian), but there are still things I miss from my meat eating days. One of those things is hot wing sauce. In no way do I miss the meat it was smothering, but I love the spicy deliciousness of the sauce. Needless to say, I was really excited when I found this Spicy Buffalo Chickpea Salad recipe over at Perry's Plate. I cut the recipe in half which was enough for Joel and me. I followed the recipe pretty closely, however I used Wing Time buffalo wing sauce and added generous amounts of Habanero powder. I also used goat cheese because we had some in the fridge, but I think blue cheese would have worked much better. Lastly, there was too much dressing. Joel was standing behind me encouraging me to add more and I foolishly listened. On the other hand though, he loved it and added even more to his own salad once I dished it out. One of these days I'll get crafty and come up with my own recipes. I fear you won't see many successes though and I'll have to add a category titled "Katie's Cooking Failures." Clever street art by French artist OakOak. What a fun way to look at the world.